(Nanowerk News) The effectiveness of cancer vaccines could be dramatically boosted by first loading the cancer antigens into silicon microparticles, report scientists from Houston Methodist and two other institutions in an upcoming Cell Reports ("Porous Silicon Microparticle Potentiates Anti-Tumor Immunity by Enhancing Cross-Presentation and Inducing Type I Interferon Response"). Model studies showed that microparticles loaded with an antigen, HER2, not only protected the antigen from premature destruction, but also stimulated the immune system to recognize and relentlessly attack cancer cells overexpressing the HER2 antigen. "We could completely inhibit tumor growth after just one dose of the cancer vaccine in the animal model," said principal investigator Haifa Shen, M.D., Ph.D. "This is the most amazing result we have ever seen in a tumor treatment study." 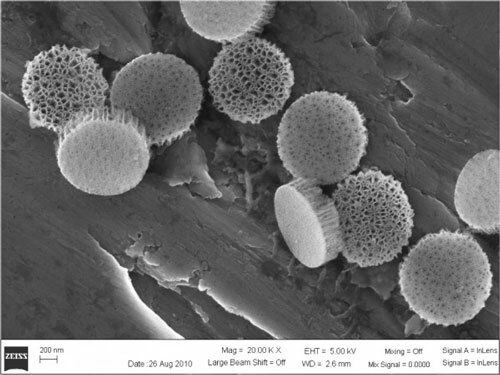 The porous silicon microparticles are about 1 micrometer in diameter. The hollow channels within each microparticle can be loaded with antigens -- such as HER2 -- that can help train the immune system to recognize and destroy cancer cells overexpressing HER2. The success of the treatment, Shen and his team learned, appears to be the porous silicon microparticles (PSMs) themselves. In vivo and in vitro studies confirmed the microparticles stimulated a strong, sustained innate immune response at local sites of tumor activity and growth -- with or without any antigen loaded. "We have shown for the first time that a microparticle can serve as a carrier for sustained release and processing of tumor antigens," Shen said. "But just as importantly, we learned the microparticles themselves appear to be enough to stimulate a type I interferon response, and were even transferred from one antigen-presenting cell to another to maintain a long-lasting antigen-releasing effect." Cancer vaccines are designed to turn a patient's own immune system more strongly against cancer cells, and have been an area of recent and intense interest among oncologists. Since 2010, the FDA has approved vaccines and other immunotherapy drugs for melanoma, prostate cancer, and lung cancer. There are currently dozens of active clinical trials evaluating vaccines for cancer therapy. Approximately 235,000 new diagnoses of breast cancer were made last year, and over 40,000 patients died from the disease. As yet, there are no FDA-approved vaccines for breast cancer. Such a vaccine might target HER2, a cell surface hormone receptor that is overexpressed in the tumor cells of 15 to 30 percent of breast cancer patients. (Such cells are called HER2+ or HER2 positive.) In this case, HER2 is both a naturally occurring hormone receptor and an antigen target for therapy. A vaccine against HER2 would train the immune system's more destructive agents to recognize the cancer cells overproducing HER2 and destroy them, leaving healthy cells more or less alone. But so far, vaccines against HER2 have seen only moderate success. "Vaccines targeting the HER2 oncoprotein have been tried," Shen said. "But these vaccines have mostly not been very potent because of inefficient vaccine delivery, a poor immune response at the site of the tumor, and other factors. We have shown that the PSM-mediated vaccine is not only potent enough to trigger tumor cell killing, but also modifies the tumor microenvironment in a way that favors tumor treatment." An important aspect of PSM function is stimulating the body's own immune system to fight cancer, Shen said. "PSMs persistently challenge the antigen-presenting cells to activate the T cells," he said. "And the PSMs modify the tumor microenvironment so that the cytotoxic T cells maintain their activity." Shen said the use of PSMs could work for any variety of cancer antigens and cancers, and that the PSMs could be loaded with multiple antigens for a single vaccine target, or multiple antigens for several targets, possibly enhancing the approach's effectiveness further. "Besides developing a highly potent breast cancer vaccine, we have also demonstrated that PSMs are versatile," Shen said. "This is a technology platform that can be applied by other scientists to develop vaccines for other types of cancers, ultimately helping, we hope, more types of cancer patients." Before human clinical trials can begin, Shen said the researchers must evaluate the toxicity of antigen-loaded PSMs.